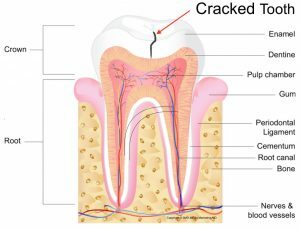 Is a Cracked Tooth Literally “Cracked”? One of the main causes of cracked teeth is eating hard foods, and especially hard candies. Biting down on hard foods puts undue stress on your teeth, eventually causing a crack to form. Often times, clenching or grinding teeth at night can also cause cracks. Finally, old amalgam fillings can cause cracks as well. The metal expands and contracts at a different rate than our teeth and overtime causes cracks in the teeth. Please contact Adams and Cheek Dentistry at http://raleighncdentistry.com/contact-our-office/ if you would like us to evaluate a possible cracked tooth. PreviousPrevious post:The Importance of Dental Cleanings During PregnancyNextNext post:What Causes Bad Breath?